It’s official: the doors are open at Silver Birch of Mishawaka. 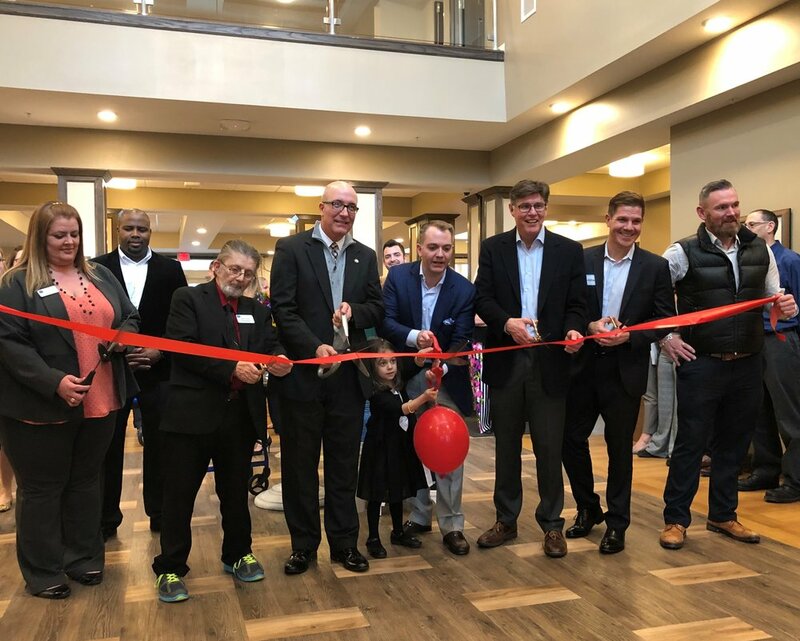 This week, principals and staff of Silver Birch Living welcomed their first residents and the greater Mishawaka community with an afternoon reception and ribbon-cutting celebration. Silver Birch of Mishawaka, designed by BEHLES+BEHLES is designed to serve seniors of all financial means. Featuring studio and one-bedroom apartments, the new 119-unit Assisted Living community offers a full spectrum of personalized services to help individuals maintain their independence in a supportive, caring environment. BEHLES+BEHLES principal, Ken Behles was on hand to greet the new residents and join in the Grand Opening celebrations with Dave Cocagne, Chairman of Silver Birch Living, representatives of the construction team from Arco Murray, and the Silver Birch family of caregivers. Dining is a high priority for prospective senior living residents and a major driver of resident satisfaction. The days of monolithic, formal dining rooms and kitchens are long gone. Less formal dining options - Café, Bistro, Wine Bar - will continue to increase in demand. Space allocation to grab-n-go and fast-casual concepts will increase, and the large formal dining room will shrink. This dining decentralization will require satellite kitchens to move into these smaller dining venues, giving customers what they really want: a variety of restaurant experiences offering a variety of healthy food options. While this fragmentation can be challenging to retrofit in existing facilities, new communities will plan for it from the get-go. Move-in day has arrived for the first group of residents at Silver Birch Evansville. BEHLES+BEHLES designed the 119-unit Assisted Living facility for Vermilion Development, a Chicago-based leader in affordable Senior Living. Silver Birch Evansville provides its residents a stimulating and dignified living environment, an engaging social service program, and assistance with the tasks of daily living. Construction on Vermilion Development’s Assisted Living Facility in Mishawaka keeps rolling along. Progress is accelerating on the building interior. Kitchen & bath cabinet installation is well underway and granite counters are arriving onsite. Luxury vinyl flooring is going into the last of the residential units while crews work outside installing the soffit & fascia to complete the building exterior. It’s always exciting to see the interior finishes & millwork in place as we approach the finish line. December completion, here we come! To test-drive a contemporary banking experience for yourself, stop by the new branch of First Bank & Trust, located at 520 Main Street, Evanston, IL. The Music Institute of Chicago has retained BEHLES+BEHLES to help restore the front porch at Nichols Hall, its performance venue in Evanston. Nichols Hall, a venerated Evanston historic structure, has been slowly watching it's Indiana Limestone front porch and stairway succumb to the elements. A century of freeze-thaw cycles and road salt has left the grand stairway in a ruinous state and beyond repair. Next Spring B+B plans to complete a full replacement of stone stairs, landings and porch slabs, restoring the limestone beauty to its former glory. First Bank & Trust recently hosted the Grand Opening of their new branch bank in Skokie, IL. Designed by BEHLES+BEHLES to achieve LEED Gold Certification, the building employs a host of sustainable design strategies designed to reduce consumption of non-renewable resources, minimize waste, and create a healthy, productive work environment. Tile Magazine recently published an Installation Case Study on the new LEED-Gold, First Bank & Trust branch designed by BEHLES+BEHLES. 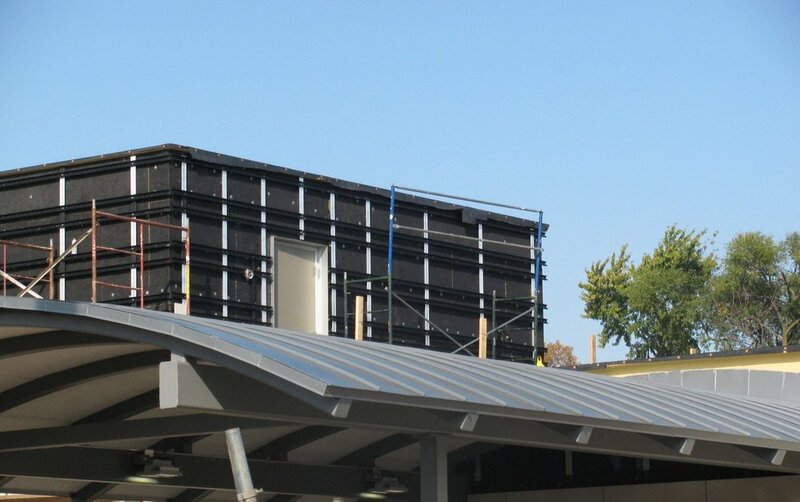 The article, titled Ventilated Facades and Their Role in LEED Designation, details installation of the building's innovative ceramic rain screen facade system. The Allendale Association's brand new Cafeteria, Shelter Club Commons, is open for business. BEHLES+BEHLES designed the new Dining Hall to provide meal service and vocational training for 200 live-in and day-school children. The building was recently awarded LEED Silver Certification by the US Green Building Council. At Camp Independence, it's all about being outdoors. And that's just what this new YMCA camp offers to a special group of kids. BEHLES+BEHLES was retained by the YMCA of Greater Chicago to assist in the creation of a new camp program designed for children with mobility impairment. The mission was to design facilities to support a full range of rugged outdoor activities and experiences, typical of overnight summer camp; and to help develop independent life skills among this special group of kids. Click here to watch their story unfold.